Downtown Crossing Reimagined - Boston International Real Estate , Downtown Boston is experiencing a resurgence in developments and improvements. As tall high-rise buildings and highbrow hotels are slowly but surely inching their way into the district, improvements on the streetscape are also on the way, with the rehabilitation of Downtown Crossing's commercial and business streets, and the Orange's line underground terminal, complete with a Times Square-esque open amphitheater. 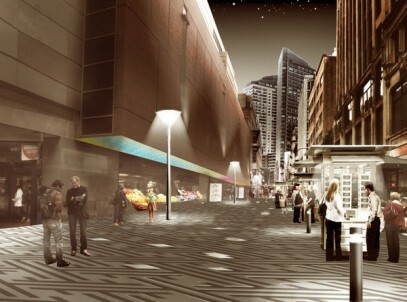 To add to this distinction, the (BRA) Boston Redevelopment Authority has selected urban landscape and architecture firm Klopfer Martin Design Group (KMDG) to develop a streetscape design program for Boston's Downtown Crossing District. KMDG , headquartered in Cambridge, was selected from 11 proposals submitted to the BRA for the project. The firm presented its long-term vision for sidewalks, roadways, pedestrian zones, signage, and the vending program, during the BRA's Annual Meeting earlier this week. In a press release posted on its website, the BRA selected KMDG for its expertise in "landscape architecture, wayfinding, urban design, and universal design". The firm will incorporate on-street retail , vending, civil and traffic engineering, and bicycling needs in their forthcoming designs, to be fully realized in time for the Spring and Summer months. In response to changing demographics, KMDG will use urban design to 'recast the crossing' as a public, open space. New wayfinding standards will be used to highlight intersections and opportunities to 'connect the connections,'" according to the BRA website. "Wayfinding components will include all modes of transportation (private motor vehicles, public transportation, bicycling, and pedestrians), informational kiosks, maps, and the area's history and culture to 'unlock the experience'. Surely, as luxury buildings like the Millennium Place and the soon-to-be-built Filene's basement replacement are in development, the district will allow for a great street experience as tourists, residents, employees, and shoppers milling about the area will be treated to a modern urban architecture - something this part of the city has long been promised and is now being fulfilled.